I know many will disagree and ask how could anyone allow a man who has overseen such vile atrocities to live? Personally I do not believe that the taking of life does anything to satisfy the terrible injustice of losing loved ones... however numerous the body count may be. Furthermore I cannot understand how any Christian can condone the organised extermination of the unsaved. Where is the spiritual logic? a new spirit. Why will you die, O house of Israel? For I take no pleasure in the death of anyone, declares the Sovereign LORD. Repent and live!" It seems to me that a lot of people on the religious right do not share this attitude... and this where I have a problem with them. By shortening any human beings life on account of their sin, you deny them opportunity to repent of their sins. It' almost as if they WANT to play eternal executioner... kill them now that they may get what is coming to to them from God quicker. this is out of step with the attitude of Christ... we should not seek the premature death of anyone, it is an abhorrent desire and it casts us in a similar vein to the monsters we despise. We are better than this and we should seek every opportunity to demonstrate it. However, "Ah" you say... "men who commit such unspeakable acts are incapable of turning from their sin!" Is that just personal prejudice speaking? Or do you have anything to back that up? I would argue the weight of history does not favour that argument. I have done some research into this and discovered that of all the Nazi war criminals who were tried at Nuremberg... there were a handful - seven or eight, who claimed to have repented of their atrocities. They did not do this to escape death (though not all them received that sentence), in fact those that were executed did not resist the fate that was to befall them... they acknowledged their wrongs and knew that the people of Earth could not tolerate the awful things they had done. pieces. I'm terrified of dying - but when will it be?" "Even though I was once a blasphemer and a persecutor and a violent man, I was shown mercy because I acted in ignorance and unbelief. The grace of our Lord was poured out on me abundantly, along with the faith and love that are in Christ Jesus. Here is a trustworthy saying that deserves full acceptance: Christ Jesus came into the world to save sinners — of whom I am the worst. But for that very reason I was shown mercy so that in me, the worst of sinners, Christ Jesus might display his unlimited patience as an example for those who would elieve on him and receive eternal life." However, Hayashi could not see past his despair... past those demons of the past and the "ghosts" of those he had mistreated. Sometimes he felt they were strangling him. Time was running out for this man, there were weeks before his execution. Miss Henty was growing desperate. She prayed that God would reveal himself to Hayashi in the same way that he had to her... the night she was led to believe in Christ as her saviour - through a vision at night. It is a fact that within this world of men, there is a world of God's Spirit. those who do not believe this fact cannot understand it. These clever men of this world, men of wisdom in this world, are all foolish. All men have weak bodies; they believe death to be terrible. I would like to continue life's journey, giving body and spirit to God, never for a moment forgetting my repentance. In this world there are billions of men. All die less than a hundred years old. Only those who know God's Spirit, those who know heaven, only the Christians... see the Spirit of God as a reality. They fear nothing... not even death. It is the will of God that I should die at 32, but Christ is with me to the last. I am filled with joy. I know the happiness of death. I believe that my execution today is a punishment from heaven given by God. Since I, Hayashi, have become Paul, I think like a Christian, my happiness is to become a spirit and pray. Although a man may live to become 70 without knowing thankfulness to God, he does not know even the preciousness of seven days of knowing God. Christians sing in church as larks sing in the Spring, as angels sing. As you study my death you will clearly see that God's Spirit has been working. God has forgiven me - I who have sinned so deeply. Moreover I do not fear execution. Through it I pray that peace may come to the world. It IS possible for men and women who commit atrocities to know salvation. I have shaken the hand of one of the Kray Gang - Chris Lambrianou, a man who did terrible things in the name of organised crime... but who came to know Jesus Christ in jail and who know works to rehabilitate people who suffer from the effects of of crime that he benefitted from. Sometimes there are consequences in this life for the things we do, but that does not exempt us from the opportunity to know God and receive his grace. My personal preference for Saddam Hussein would be to have him personally repatriate the bodies of Kurds and people he had killed. Condemn him to manually dig proper graves for all those people until the day of his death. 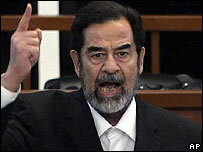 When the day comes for Saddam Hussein to die, I shall not rejoice. He is an evil and despicable man... but I shall pity him should he deny himself the opportunity to get himself right with the one true God before his flame is extinguished. I think he should live, not because he is unsaved, but because his death will cause more deaths in Iraq. And at every execution, don't they give them a chance to repent? Isn't that what the priest is for? Personally, I am on the fence regarding capital punishment. I could not rejoice in the death of any unsaved soul. But I would like to quote Genesis 6:9 "Whoever sheds the blood of man, by man shall his blood be shed."